Today we are interviewing Diane Gallagher, author of the ChickLit/Bildungsroman novel Greenwich List. I’ve been infatuated with books since I learned to read at age 3. As soon as I learned how to write I started writing stories and have been doing it ever since. In my day job, I am a teacher-librarian at a high school – a job I love because the kids keep me young. I also spend a lot of time working with queer youth and I have just recently started exploring the idea of training to be a lay pastor. I love travelling and have done quite a lot of it. In my twenties and thirties my focus was on Asia but in my forties and later my sites turned towards Europe. In recent years, my husband and I bought a house in Sicily and our retirement plan is to spend six months in Canada and six months “under the Sicilian sun”. I love being in Italy; there is so much there that is now influencing my writing. Describe the plot of Greenwich List. Greenwich List is the story of a young woman, Gwen, who comes to London after the break-up with her abusive boyfriend and boss. While there, she meets Umah and Brody who, in an attempt to help her recover from the break-up, give her a list of crazy things to do – paintball, roller disco, zorbing – over the course of the weekend. Running parallel to this is the story in a romance novel that Gwen picked up in Greenwich Market with a heroine on the cover who looks remarkably like Gwen. Who would most appreciate Greenwich List? I think all women would enjoy this story – ages 16 to 60 (or more), particularly those who have an interest in travel or in London as the novel takes the reader all over the city. Also, any woman who has been through the break-up of a not-so-great relationship will sympathize and perhaps recognize the emotional ups and downs that Gwen faces. What inspired you to write a book about a woman who deals with heartbreak in an unusual way? There were a few things that led to the writing of Greenwich List. The first, and most obvious, is that I had entered the Three Day Novel contest back in 2009 and Greenwich List is what I produced. Over and above that, however, I related to Gwen in that my first marriage was similar to the relationship she had just left. Much of what Gwen was feeling were things that I had felt myself. In regards to the list, I had been in London in 2005 visiting a very good friend. She was on the cusp of turning 30 and her friends there had given her a list of 30 crazy things to do and if she completed them all, they would throw her a huge birthday bash. So, putting all these things together I got Greenwich List. Tell us a bit about Gwen. Gwen is young. She hasn’t yet learned her worth otherwise she would have kicked Ken to the curb very early on. She has a sweet nature and loves to give happiness to others yet it is only through completing this list that she begins to see the value of giving herself happiness and, by reading the parallel romance novel, the importance of tapping into her inner strength. She also discovers that it is not a bad thing to have gone through such a bad break-up and abusive relationship because by doing so it gave her permission to move on with her life. What happens to Gwen during her life changing adventure? Gwen comes to London after the break-up with her abusive boyfriend and boss. While there, she meets Umah and Brody (and a cast of other off-beat characters) who, in an attempt to help her recover from the break-up, give her a list of crazy things to do over the course of the weekend that lead her to self discovery. First and foremost, I hope readers enjoy and are uplifted by Gwen’s story. In my life, I have discovered that even the terrible things in life have a purpose and I have tried to convey that hopeful message in Greenwich List. I would be very happy if even one person came out of reading this book understand this in their own life. I started writing stories almost as soon as I learned to read. I was reading Dr. Seuss at age three and Robert Louis Stevenson by age four. That is about when I started trying to put my own stories and books together. In high school my short stories received honourable mentions in several writing competitions and I have been writing poetry – some good, some spectacularly bad – since I first read A Child’s Garden of Verses. Some of the better and later stuff has been published. Greenwich List was the first novel I actually finished but there were three unfinished and abandoned novels before it. I’m not sure about my style but there are certainly authors who have influenced the themes I address and the genres in which I write. Fantasy always fascinated me and the authors that have most influenced me there have been E Nesbit, JRR Tolkien, CS Lewis, JK Rowling, Christopher Moore and Neil Gaiman. In terms of themes, feminist themes and issues of social justice are very important to me and the authors over the years that have impacted me most are Margaret Atwood, Erica Jong, Charles Dickens, Richard Wagamese, Lee Maracle, Dr. Seuss, Joan Aiken, Charlotte Bronte, Jane Austen and again Tolkien, Rowling and Gaiman. One last author who had a big influence on me is Sylvia Olsen. I heard her speak one day and she talked about how she had had her first novel published at age 50. I was 48 at the time and, until then, I had thought I was too old to start a writing career. She showed me that it is never too late to start writing. The growth in my writing has paralleled my own personal growth. I now have a deeper and broader understanding of the themes about which I write than I did earlier in my life. With each work I finish, I find that I am learning something new about the craft and I search out other writers with whom I can discuss technique and other issues about writing. I am quite excited to be taking a workshop with Richard Wagamese in June. Is there anything about writing you don’t like? I think anything that puts a book in front of a reader is a good thing. Also, it allows writers more access to publishing and to self publishing in an affordable way. Granted, there are some books that have been self published that perhaps could have used a little more work, but overall, I think having a wider body of work available to the reading public that is much more affordable is always positive. If it makes one person a reader that wasn’t before, how could it be negative? I will be retiring from my teaching work within the next year and I want to use the time to write longer and more consistently. I always have ideas floating around in my head – at least five or six at any given time – and I’d like to see at least some of them come to fruition. Also, I’ve been playing with the idea of starting a small publishing company focusing on “island writers”. I think island people have a different perspective than those who have never lived completely surrounded by water. It’s just an idea at the moment – not quite as well formed as a goal. No, thank goodness. In fact, quite the opposite. I usually have too many ideas clamoring to be written down! My next project is actually finished and I am looking for a publisher. It is a story about three women and their connection with each other over differing times and places. It deals with themes like family secrets, personal choice, and religion versus spirituality. One of the projects that I am working on now is a murder mystery written in the steampunk style with a definite occult aspect to it. It probably fits in the genre of weird fiction. I am also writing a collection of sci fi/fantasy short stories. 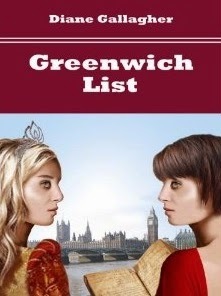 Is there anything else you’d like potential readers to know about Greenwich List? I think I would like readers to know that this book was a breakthrough for me. I had never believed that I had the writing stamina to finish a novel. I would like other aspiring authors to know that it is possible for them, no matter what their age. Gwen’s soul was lifted as she looked across the city that was doing its very best to change her life. She raised her eyes skyward and whispered a little prayer of thanks to God or fate or whatever had pushed her in the direction of London and had put her in Greenwich Park two short days ago. Gwen raised her arms, and closed her eyes and from her mouth came the sweet tones of the old Welsh hymn that she had always loved as a child. As the notes died away, Gwen lowered her hands, took a deep breath and turned to go back down the stairs. Behind her was a middle-aged woman standing with her mouth open and her hands clasped in front of her. “Oh, thank you. That was so beautiful. I’ve come all the way from Canada and you just made my visit here… I don’t know, I don’t have any words for it.” The woman had tears in her eyes and as she thanked Gwen, she took Gwen’s hand and squeezed it. “My mother was Welsh – she used to sing that very hymn when I was a child. I haven’t heard it in years. Thank you so much.” With that, the woman embraced Gwen. “You’re welcome. Where did your mother come from?” Gwen asked. I am ordering this book immediately. From the excerpt, I can tell that it will be a fabulous read!